We Are Dedicated and well Trained Home Cleaning service Group Motivated to Help People In There Busy Life Keep Their Home The Way Is Should Be, A Home. To That Extent We Have Go To That Extra Mile To Meet Up With International Cleaning Services. Got an event? 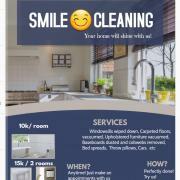 Get in touch with SMILE 😊 CLEANING.